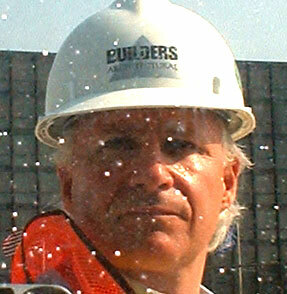 Mark Meshulam is an expert witness and consultant for leaking windows. 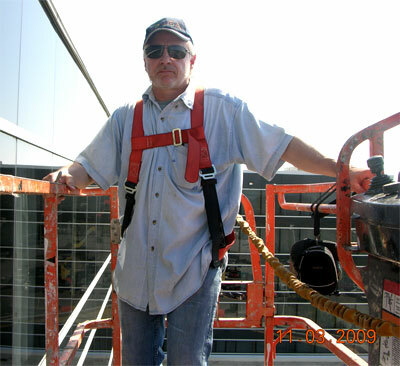 Window / Curtainwall Consultants are a macho bunch who get to wear harnesses and ride boom-lifts. Imagine getting paid for this! Surveying field conditions requires on-the-fly creativity. First, you must be experienced enough to recognize a new field condition, then you must quickly assign it a meaningful name. Sometimes, it can also be very helpful to assign the condition a unique graphical key, or symbol, which will make the viewing of your survey sheet more readable and intuitive. A great example is a survey I performed last week on a leaking curtainwall. A pattern emerged wherein the exterior horizontal framing members were spliced at locations not recommended by the manufacturer. This resulted in unsightly water stains on the glass as water drained from the splices. To try to get a better grasp on the pattern, I created a symbol for the splice location, and also for the appearance of water stains on the glass. In some areas these were coincident, some others not. Symbolic keys created on-the-fly during a curtainwalll leak survey. Infantile handwriting is due to boom-lift swaying in the wind 65 feet in the air. What's your excuse? There was also a previous repair to the same areas, where someone had applied sealant to the top of the horizontal, obviously to reduce water intrusion. When I became aware of this new piece of information, I then created a symbol for this. Identifying, naming and creating a symbol is the hard part. Once this infrastructure was in place, I could relatively quickly survey the selected area of the curtainwall and place my newly created symbols on the enlarged elevation. It is not uncommon to overlook a condition which potentially pertains to the window or curtainwall leak when first starting the survey. After all, you are viewing scores of attributes of the window or curtainwall. You will not yet know which things are important and which are incidental. These chicken scratches are actually deeply meaningful symbolism for not only curtainwall attributes, but the actual meaning of life itself! Sort of, at least. But once a particular condition’s frequency gains enough critical mass to get your attention, then is the time to catalog it. This means naming it, photographing it as an example, creating a symbol for it, then location the symbol on the survey form. Need your window leaks surveyed? Now the skylight team is hard at work. One of their first tasks is to assemble the rafters. The assembly consists of a long rafter mitered to a short rafter.